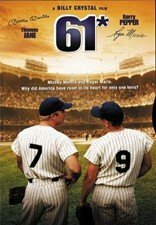 The 1961 quest of New York Yankees sluggers Mickey Mantle and Roger Maris to break one of baseball's most cherished records--Babe Ruth's single-season home run tally of 60--and the media scrutiny and controversy that followed the disparate teammates is vividly captured in this drama directed by Billy Crystal. Thomas Jane and Barry Pepper star, respectively, as the "M & M Boys"; with Anthony Michael Hall, Donald Moffat. 129 min. Widescreen (Enhanced); Soundtracks: English Dolby Digital 5.1, Dolby Digital Surround, Spanish Dolby Digital stereo; Subtitles: English, French, Spanish; audio commentary; "making of" featurette; theatrical trailer; biographies.